Radiology Ultrasound - Diagnostic Healthcare Ltd. Diagnostic Healthcare (DHC) provide a mixture of managed service solutions for Radiology departments nationwide. This could be as little as one day a week to a seven day a week service or some Trusts just want a weekend, the flexibility is there to suit each department’s needs. DHC has numerous reference Hospital sites that cover all spectrums of the service including staffing, with or without ultrasound scanners – and our own sites based in primary care that can be utilised. DHC’s ultrasound department is managed by the Head of Ultrasound, who has geographical leads (also senior sonographers) who manage the core team of sonographers and HCAs in each area. They are supported by an operational manager and administration (admin) department where our central booking, admin and operations management take place. DHC has a core team of over 80 sonographers who have the right skill mix to provide the ultrasound services to NHS Trusts and community sites. 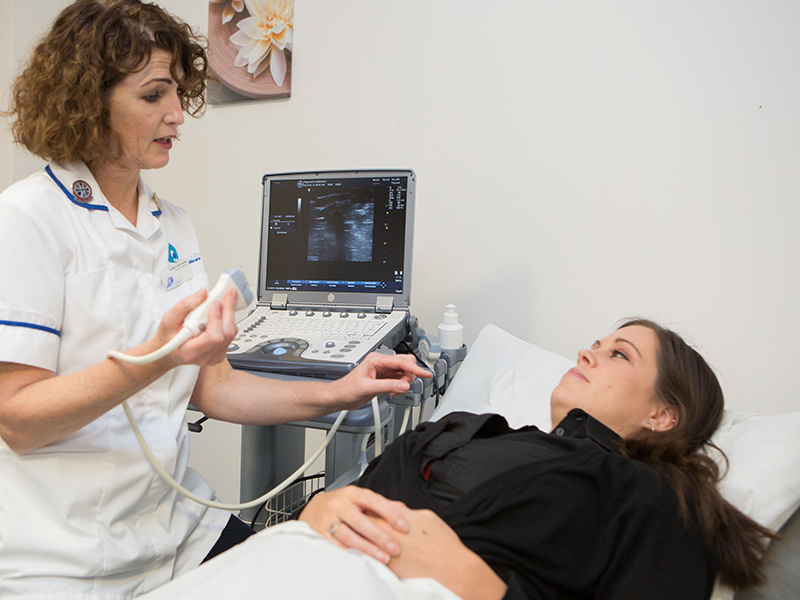 DHC’s Ultrasound Clinical Director, a consultant Radiologist, supervises ultrasound activity, providing our sonographers with rapid clinical support, training and feedback. This facilitates a steeper learning curve and further enhances clinical confidence and an understanding of the patient’s management pathway as a whole, rather than as an isolated scan episode. The team of sonographers are all very senior, HCPC registered, CRB checked, with 2 years’ minimum experience. The sonographers are all assessed (clinical competency procedure) and undergo a robust recruitment process which has been adapted from the recruitment and induction process of the NHS. All staff complete annual training which includes both mandatory training, and additional modules to develop skills and improve their knowledge and abilities. Upon request, a list of the sonographers and their skill mix can be generated. All DHC staff undergo competency assessments in Trust systems, procedures and protocols prior to working autonomously. The robust quality assurance programme used by DHC engenders clinical confidence. Staff are involved in audit and peer review and the results are communicated to the Trust lead sonographer. Once the booking process is established with Radiology Department, DHC works with the department to deliver sufficient sonographer capacity to deliver the necessary number of sessions to cover the patient population over a variety of appointment slots ranging from daytime, evening or weekends and based on the scan type. DHC will manage the sessions in accordance with the department’s processes for cancellations, rescheduling and rearranging patients accordingly. DHC’s work to a variety of KPIs that demonstrate a high standard of service and uptime provided with minimum need to reschedule or cancel provision.